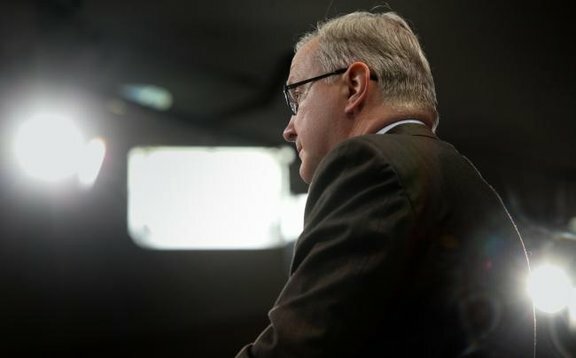 Olli Rehn, the European Commission's vice president in charge of economic and monetary affairs, has reportedly told the Finnish press that he may run to head the Alliance of Liberals and Democrats for Europe (ALDE) group’s list in European elections next year, so becoming their candidate to be the next president of the EU executive. Asked by EURACTIV to comment, Rehn's office did not deny reports of a possible candidacy. "We underline Vice-President's Rehn continued European commitment. It is for the Vice-President himself to decide on any participation in the elections. But no decision has been taken at this stage." ALDE will meet in November in London to draw up their list of candidates. In Finland, the Centre Party and the Swedish People's Party are both members of the ALDE. In the early 1990s, Rehn was vice president of the Centre Party, a centrist, liberal and agrarian party that obtained 15.8% of the votes at the last 2011 election. Both parties have expressed their support for Rehn's candidacy, the Finnish website YleUutiset writes. Leaders of political family lists in the European elections automatically become candidates for the next president of the European Commission. According to the Lisbon Treaty, the next Commission president will be chosen taking into account the results of the European elections. Considering the modest result obtained by ALDE at the last election in 2009 (84 MEPs out of a total of 736), it is highly unlikely that the Liberals will beat the other two major political groups – the centre-right European Peoples’ Party (265 MEPs), or the Party of European Socialists (184 seats). But the ALDE nominee might stand a chance as a compromise candidate in a situation where no clear winner emerges from the centre-left or the centre-right. The PES and EPP have already announced that they will chose a candidate for Commission president well ahead the European elections to mobilise voters. The name of Parliament president Martin Schulz, a firebrand German social democrat, has widely circulated as the likely PES candidate. Rehn is the only commissioner to have been “promoted” in the Barroso II administration, having become in October 2011 the Commission's vice president and de-facto economic affairs minister of the eurozone. But for Rehn to obtain the ALDE nomination, liberal forces in EU countries would have to support his candidacy. In many states Rehn is viewed as the EU’s top austerity preacher, and not really a liberal politician. Rehn's candidacy is likely to upset at least two political heavyweights. One is the current leader of the ALDE group in the European Parliament, Guy Verhofstadt, a friend of Rehn's, who is seen as the natural Liberal candidate. The second leader who would certainly not like Rehn's candidacy is the Finnish prime minister, Jyrki Katainen, from an EPP-affiliated party, seen as a possible candidate to lead the list of the centre-right political family at the European elections. It is highly unlikely that the lists of two of the three major European political families be led by leaders of the same nationality. In the first Barroso Commission, Rehn was responsible for the bloc's enlargement policy. He is the architect of the special arrangements for Bulgaria and Romania, which joined the EU in 2007 under an unprecedented monitoring mechanism of their law enforcement systems. Under his previous term as Commissioner, Rehn enchanted his hosts in EU candidate countries by playing football in friendly matches. In his youth, he had been a semi-professional football player. But Rehn's new capacity no longer allows him to resort to such public relation stunts. The 2014 European elections will be the first to be held under the Lisbon Treaty, which sought to enhance the role of citizens as political actors in the EU. The Lisbon Treaty also strengthens the powers of the European Parliament, consolidating its role as co-legislator and giving it additional responsibility: it elects the president of the Commission on the basis of a proposal by the European Council taking into account the results of the European elections (Article 17.7) of the Treaty on European Union.